This is the recipe I have used over and over again because it is so simple and delicious! I love getting my veggies in an awesome and flavorful way! Thank you for your comment–I’m so glad you enjoy it! I can’t wait to try this, and hope I am able to find some heirloom carrots. Thank you so much, and I am going to check out your other recipes! Hello! I’m so happy I found your blog, it’s wonderful & I can tell I’ll be back again! I am working on a recipe round-up on my own blog & would like to include this as one of the recipes if you don’t mind. Let me know if you’d rather I did not & I will take it down. Looking for new recipes for thanksgiving this year and these are perfect! How exactly do you mean to wrap the carrot tops in foil to prevent burning? 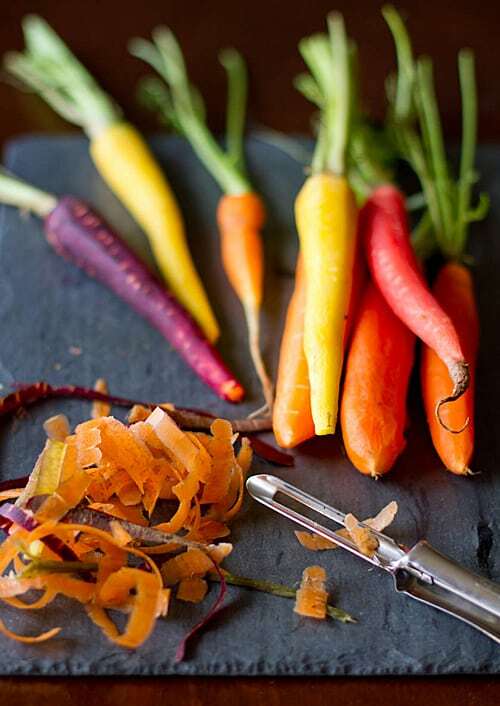 If you leave the leafy tops on the carrots for looks (like we did in the photos), you’ll want to protect them from the heat of the oven by wrapping them in foil. If you take the tops off, you don’t have to worry about it. 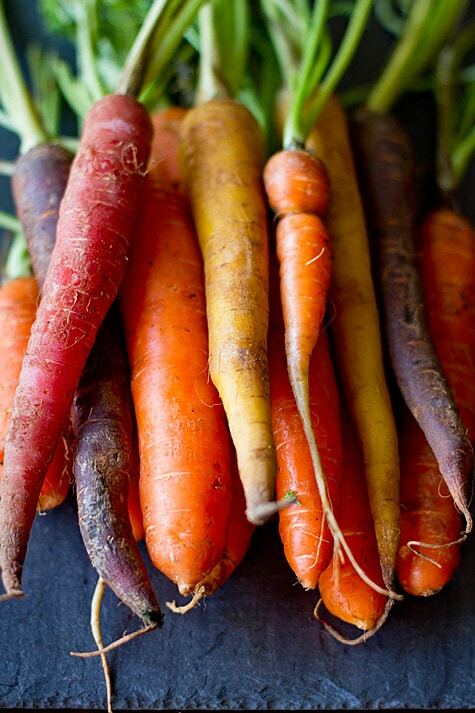 These carrots look great. Where can you buy purple carrots? I am going to recommend your blog to a friend who recently became a vegetarian. These are so delicious, my 8 year old daughter begged me to make them again for Christmas before we had even finished carving the turkey on Thanksgiving. They are roasing at same temp as the potatoes, and going to be a wonderful side to the rosemary stuffed standing rib roast. Thank you for a new holiday tradition. Can you use freshly picked rosemary or does it have to be dried first? This was so easy and delicious. 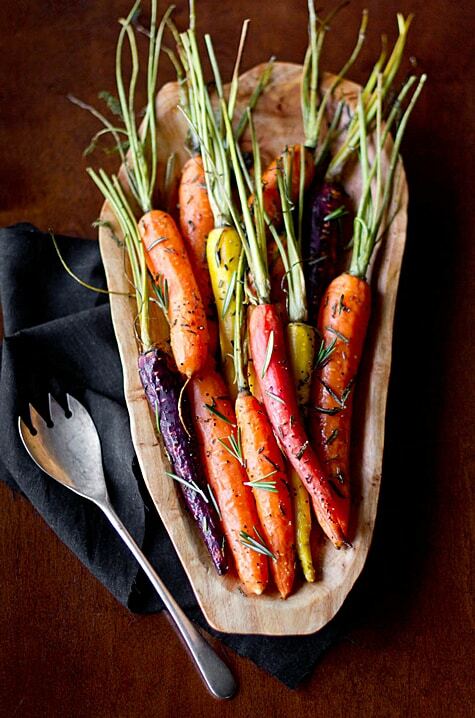 I didn’t even bother to peel the carrots and used dried rosemary. Will make again. Thanks for sharing. This recipe looks so simple and the photos are gorgeous. Do you think I can use baby carrots? If so, approximately how many?? I would use about a pound of baby carrots. I added 50 gm of cheddar cheese, 1 tablespoon dripping or goose fat to add its taste. I need to say that it’s one of the tastiest dishes which I have tried till now. I tried baby-kale-raspberry-salad for the first time, and my son loved it,. I shared your website with my colleagues Kately and Silvia who just enjoys trying out these types of recipes with carrot. I love your recipes. Unfortunately, when I try to pin things I can’t, I am told I need to “unblock pop up blockers”. I have an issue with another site, I do not have pop pups blocked! Can you fix this ? Hi Jeanne, I just tested this out, and from my browsers (I tested both Google Chrome and Safari) pinning wasn’t a problem. I’ll have our tech people check things out just in case, but it’s possible you need to clear the cache on your browser, or try another browser. Have you tried a Pinterest extension within your browser at all?